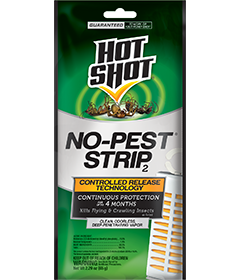 The Hot Shot® No-Pest® Strip2 utilizes controlled release technology to slowly diffuse a deep-penetrating vapor in enclosed spaces for up to 4 months. The clean, odorless vapor is evenly distributed throughout the enclosed treatment area, killing visible and hidden insects on contact and preventing new insect infestations while you’re away. This product contains the toxic inert ingredient Bis (2-ethylhexyl) adipate (DEHA) at 19.8%. Remove pre-assembled Hot Shot No-Pest Strip2 from sealed bag when ready to use. Do not allow children to handle new or used strips. Place in desired location away from windows and out of reach of children and pets. Drafts, weather and other conditions may affect the performance, but treatment usually lasts for four (4) months. One 65 g strip will treat 900-1,200 cu ft. Record the date of installation and replace with a new, fresh, full-strength strip at the end of four (4) months or when effectiveness diminishes. Do not use in the food/feed areas of food/feed processing or food/feed manufacturing or food/feed service establishments. Non-food/feed areas of these establishments where the product can be used are areas such as garbage rooms, lavatories, floor drains (to sewers), entries and vestibules, areas of office buildings occupied for less than 4 hours per day, locker rooms, machine rooms, boiler rooms, utility equipment, garages, mop closets, and product storage (after canning or bottling). ies, gnats, mosquitoes, moths, silversh, cockroaches, spiders, beetles, earwigs and other insects as listed. For use in unoccupied areas; not for use in homes except garages, attics, crawl spaces, and sheds occupied by people for less than 4 hours per day. Also for use in boathouses, or enclosed areas thereof, occupied by people for less than 4 hours per day. Also for use in the following unoccupied structures, provided they are unoccupied for more than 4 months immediately following placement of a pest strip: vacation homes, cabins, mobile homes, boats, farm houses, and ranch houses. FOR USE IN UNOCCUPIED AREAS; NOT FOR USE IN HOMES EXCEPT GARAGES, ATTICS, CRAWL SPACES AND SHEDS OCCUPIED BY PEOPLE FOR LESS THAN 4 HOURS PER DAY. Vacation Homes, Ranch Houses, Farm Houses, Cabins, Mobile Homes, Boats that are unoccupied for more than 4 months immediately following placement of pest strip. Garages, Storage Units, Attics, Crawl Spaces, Boathouses, Sheds occupied by people for less than 4 hours per day. Controls flies, mosquitoes, gnats and other insects as listed. Kills flies and other insects as listed for up to four (4) months. Remove from sealed bag and hang or stand, out of reach of children and pets, in an open space of an enclosed area, away from windows. Do not allow children to handle new or used strips. One 65 g strip will treat 900-1,200 cu ft, which is about equal to an average room 10’ x 13’ with an 8-foot ceiling for up to four (4) months. In a larger room, if more than one strip is required, keep them at least 10 ft apart. Record the date of installation so that the old strip may be replaced with a new, fresh, full-strength strip at the end of the four (4) month period or when effectiveness diminishes. Storage: Do not contaminate water, food or feed by storage or disposal. Do not open or remove from package before ready to install. Store in cool, dry place. Do not open or remove from package before ready to use. Disposal: If empty: Place in trash or offer for recycling if available. If partly filled: Call your solid waste agency for disposal instructions. Never place unused product down any indoor or outdoor drain. Nonrefillable container. Do not reuse or refill this container. Offer for recycling if available or dispose of the empty container in trash. WARNING: May be fatal if swallowed. Do not get in mouth. Harmful if inhaled. Causes moderate eye irritation. Avoid breathing vapors. Avoid contact with eyes or clothing. After prolonged storage, a small amount of liquid may form on strip. Do not get liquid in eyes. Wash thoroughly with soap and water after handling and before eating, drinking, chewing gum, using tobacco, or using the toilet. Remove and wash contaminated clothing before reuse. Do not use in hospitals or clinic rooms, such as patient rooms, wards, nurseries, operating or emergency areas. Do not use in kitchens, restaurants or areas where food is prepared or served. Do not use in homes except for garages, attics, crawl spaces, and sheds occupied by people for less than 4 hours per day. Not to be taken internally by humans or animals. Have person sip a glass of water, if able to swallow. Do not induce vomiting unless told to by a Poison Control Center or doctor. Do not give anything by mouth to an unconscious person. Move person to fresh air. If person is not breathing, call 911 or ambulance, then give artificial respiration, preferably mouth-to-mouth, if possible. Call a Poison Control Center or doctor for further treatment advice. Probable mucosal damage may contraindicate the use of gastric lavage. POISONING SYMPTOMS: This product is a cholinesterase inhibitor. Symptoms include weakness, headache, tightness in chest, blurred vision, non-reactive pinpoint pupils, salivation, sweating, nausea, vomiting, diarrhea, and abdominal cramps. TREATMENT: Atropine is the specific therapeutic antagonist of choice against parasympathetic nervous stimulation. If there are signs of parasympathetic stimulation, atropine sulfate should be injected at 10-minute intervals in doses of 1 to 2 milligrams until complete atropinization has occurred. Morphine is contraindicated. 2-PAM is also antidotal and may be administered in conjunction with atropine. Clear chest by postural drainage. Have the product container or label with you when calling a Poison Control Center or doctor or going for treatment. In case of emergency, call 1-800-917-5431. Buyer assumes all responsibility for safety and use not in accordance with directions.